The humanities! Not so HUMAN? Long ago, homo sapiens weren’t the only people on the block. Before modern humans arrived from Africa, Europe was home to Neanderthals. We usually think of this sister species as brutish and uncultured. And certainly not capable of making art. But since none of them are around anymore, it’s hard to be sure. Could the Neanderthals have had more culture than we think? Enter Alistair Pike from the University of Southampton. He and his team of archaeologists studied cave paintings in Spain. The paintings include hand outlines, animals, and symbols. Pike used brand new techniques to determine the age of the paintings for the first time. Turns out they’re at least sixty four thousand years old! 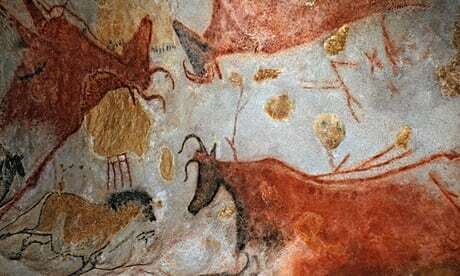 This makes them the OLDEST known cave art in the world. They were painted WAY before homo sapiens moved in. So, the artists must have been Neanderthals! This discovery challenges the idea that our lost sister species lacked culture. These paintings suggest they had more of it than previously thought. It’s a shame we missed out on Neander-modernism!